We have available the Bump application update shared Dropbox files. Bump, a popular application for sharing information with other mobile phone users has been updated so you can share files with Dropbox. 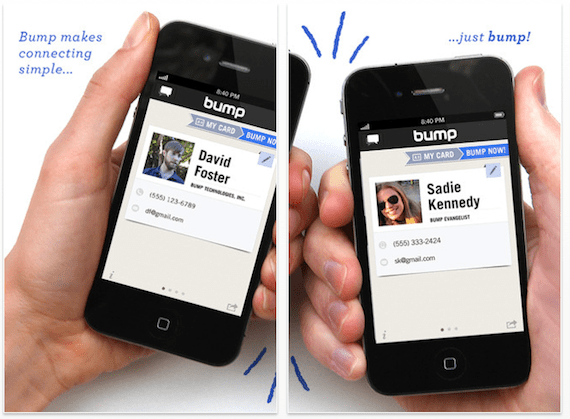 Use Bump to share contact information, pictures, videos and files simply by bumping two phones together. Only open the Bump app, grab their phones and gently bump hands with them and magically Bump will do the rest. Share contacts: Share your contact information, you can connect to Facebook, Twitter and LinkedIn. Photo Sharing: Share photos and videos with friends and family. Share files: files or documents stored on the device. Devices with SYNC: Move contacts, photos and files between your devices. Now you can share files with Dropbox. And do not forget, you can knock pictures to your Mac or PC , by going to http://bu.mp web browser on your computer and hit the spacebar key with the device. It looks like magic. Bump can download from the App Store for free if you do not enjoy this amazing app to share files with friends and family at the link below. No excuse to share files with your iPhone with any other phone from another company. Article Update Bump application sharing Dropbox files was originally published in News iPhone .